I’ve just started teaching my second lot of year 12 students the new (AQA) Physics A-level. I believe the move from coursework / assessed practicals in the form of EMPAs etc. is a positive one but, like many colleagues, I’m still finding my way when it comes to the best approach to take to ensure the best outcomes for my students. I think the first practical students do in Year 12 needs to cover some key ideas and get students thinking like A-level students, but it should not be overly complex or demanding – for example, I think the measurements should be straightforward to take so that we can focus on measurement uncertainties arising only from the precision of the instruments, and any relationship being investigated should be linear, giving a straight line graph. I’ve struggled to find an existing worksheet or activity in a textbook which meets these needs, so I’ve produced a worksheet for a practical investigating how the resistance of a wire varies with length. My aim is to get students taking measurements, doing some basic uncertainty calculations, and plotting a straightforward graph and using it to find a gradient, having already introduced key ideas about A-level practical work in a previous lesson. The worksheet has an extension activity on using a micrometer to measure the diameter of the wire, as this seems to be a good opportunity to get students using this particular instrument. 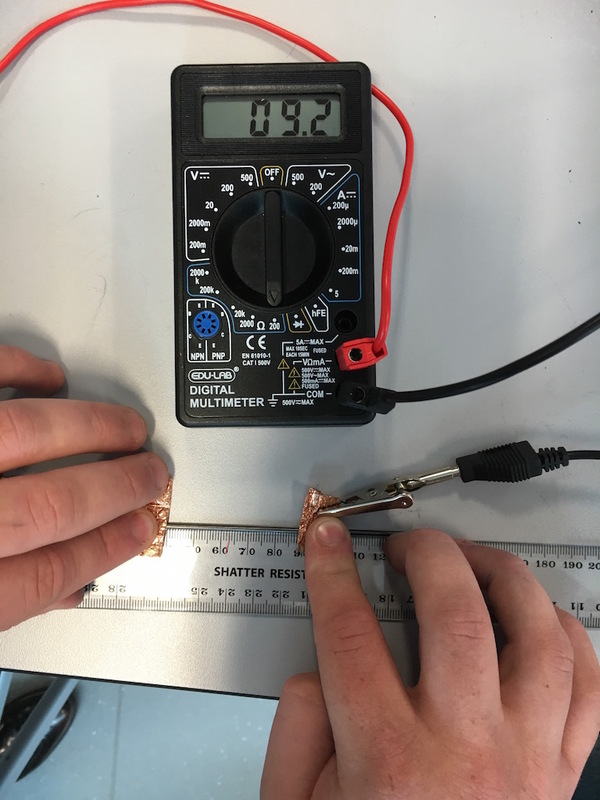 Since the main objective of the lesson is to teach these practical skills, I will not be going into the Physics of why the resistance of the wire changes with length – students should be familiar with the idea of resistance from GCSE, and resistivity will be covered when they study electricity later in the course. I’d appreciate feedback on this from fellow Physics teachers – let me know what you think (e.g., am I trying to squeeze too much in?) and please suggest any ways to improve the worksheet (or tell me to get rid of it entirely). Feel free to take this and amend for your own purposes, but please let me know if you do and let me see what approach you’re taking. UPDATE 12th Sept 2016: I’ve added a picture to this post to show how you can use a graphite rod (inside of a pencil) , a 30 cm ruler, and a couple of pieces of copper to help make the practical even easier to do. I haven’t amended the worksheet but it’s in MS Word format so you can change it yourself if you use the worksheet and this method. Fantastic example of your cooperation and openness in sharing the worksheet. Not a Physics teacher so will not wade in to the open discussion. I have read how uncertainty is defined for the A level AQA but just wonder if “the uncertainty is given by half the range” could be expressed a little more openly as something like “the uncertainty is to be taken/expressed as half the range”. 1. Plan an investigation into the hypothesis that length of wire effects resistance. 2. Key words and looking at the precision and units of measurement of different instruments. 3. Complete practical on how length of wire affects resistance, including designing and drawing a ‘perfect’ table for the results. 4. Analysing, concluding and evaluating the experiment. I have resources for these if they would be of interest. “yes” the practical knowledge is the best way to learn some thing it is applicable in every fields but physics is one of the different prospectus to go on the beyond the the practical world.